3Dimage® 3D Pen is world`s Best teacher, embrace your creativity, touch your creative side and make something that truly make people amazing. It easy to use for kids, Can help children to improve spatial thinking ability, to encourage kids' creative imaginations. 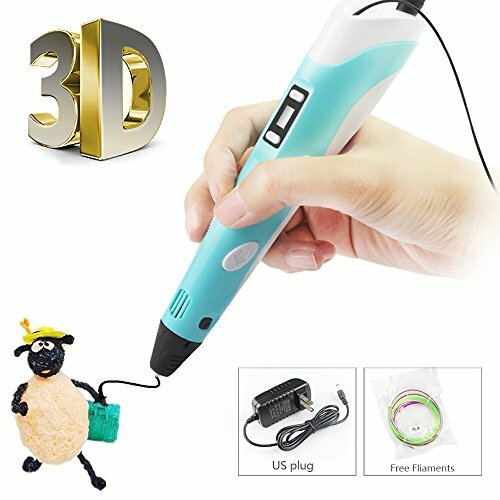 3Dimage® 3D Pen has enough features to keep them happy for a long time, and as long as they operate under a proper supervision, things won't go wrong. Good gift for children to create their art inspiration with drawing artistic works. Extremely user friendly for both kids and veteran artists. It also a best toy for boys or for girls. 3Dimage® 3D Printing Pen comes with one of the best thermal control, in addition to that, the 3D printing pen also manages to notify you about the filament getting stuck. Last but not the least, in case you hate the super-fast or super-slow extrusion of many 3D pens, you don't have to worry about this one as it actually lets you control the extrusion according to your own preferred speed. You can easily control extrusion speed for smoother operation and endless creation. We can see everything is three-dimensional, but we usually create using the ordinary pen and pencil are two dimensional, the 3Dimage® 3D Pen can add another dimension and make the drawings and artwork extra realistic. We can draw something in the air, instead of only on a flat surface. :) It is a Good gift for children to create their art inspiration with drawing artistic works. If you have any questions about this product by 3Dimage®, contact us by completing and submitting the form below. If you are looking for a specif part number, please include it with your message.